KidSpirit has a long history of both practicing and teaching safe archery. 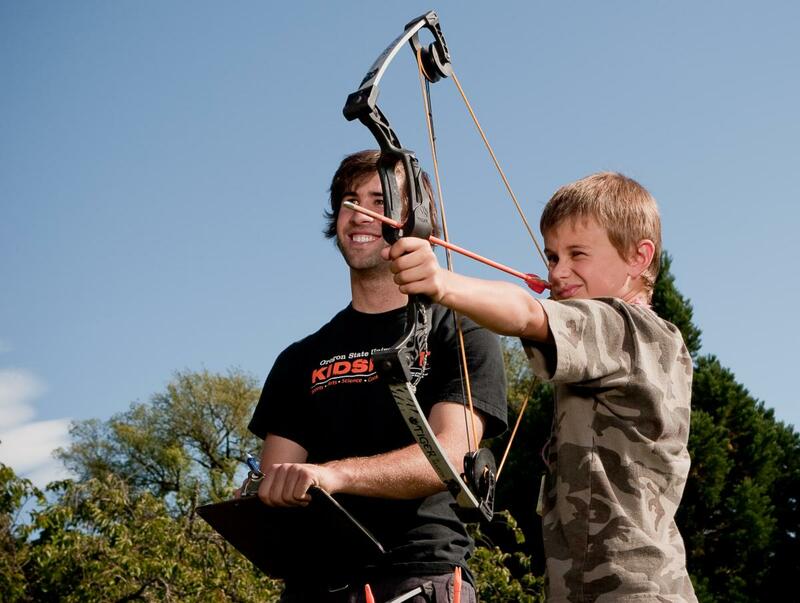 Archery lessons at Kidspirit give your child a chance to learn the ins and outs of a bow and arrow. In our archery classes, they will learn the mechanisms and techniques of firing, proper safety precautions, archery vocab, and history lessons about this exciting sport! Our instructors will work hands on with your child to help improve their stance, aim and focus. Whether you're a regular Robin Hood or have never picked up a bow before, we have a class for you! Archery’s easy to learn, but difficult to perfect. Although fun, it can be frustrating – and patience in practice is essential for a longer-term future in the sport. Having the determination to precisely repeat a technique makes you a better archer and those skills transpose into lifelong tools. Staying calm and accurate under pressure is an ability that archers develop by managing their breathing, concentration and nervousness. When you’re shooting well, hours can pass by in a blink of an eye – and, as much as the sport can be sociable, when you’re on the line, archery is only about you and your bow. The perfect time for some internal meditation. What If We've Never Done Archery Before? Worry not! 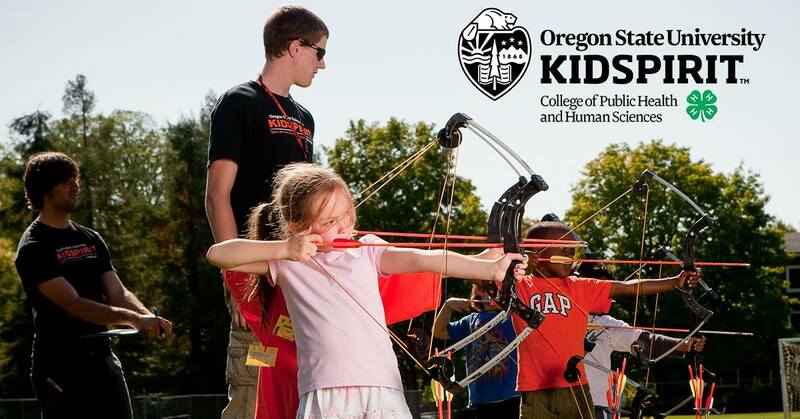 Kidspirit Archery is a professional program dedicated to working with children of all levels. Our instructors are trained on how to teach all skill levels. All children who go through Kidspirit Archery will gain the knowledge of a lifelong sport. Archery teaches key disiciplines and most importantly focus. Archers learn to maintain focus on their shot routine, avoiding distractions like wind, distance, noise and their competitors to deliver the perfect arrow. That control is beneficial for other areas of life, too. Is KidSpirit Archery a 4-H Affiliated Program? All of the lessons taught at KidSpirit come directly from 4-H objectives. Our instructors write their lessons based off of what 4-H believes to be the most impactful skills. In our Arrowheads class, we teach our junior archers the proper archery stance, bow and arrow holding technique, and all about the different elements of the bow. Arrowheads learn the mechanics of a bow and arrow (How do bows work? What makes an arrow fly straight instead of curvy?). Your child will come home excited to share the history of archery along with all different types of bows and arrows! Bowmasters-level classes teach different archery stances, the mechanics of drawing back on the string, aiming techniques, and the form and precision of shooting. We'll also introduce the Bowmasters to competitive archery techniques such as scoring, olympic rules, and more! On home game days class will be held at the E.E Wilson archery range. This is an outdoor archery range with targets at all different distances. Classes will still begin at 10 and you are responsible for transportation of your child to and from the venue. Directions: Travel 10 miles north of Corvallis on Hwy. 99W. Turn east on Camp Adair Road. Check out the Google Map directions here! Classes take place in the Langton Golf Cages, a covered area towards the south end of Langton hall between Langton and Dixon Rec Center. Can't find us? First step: don't stress! Look at this map, or contact the KidSpirit office and we'll be happy to help you find your way. Pick-up takes place at the golf cages once class has ended. Instructors will notify you if classes will be at E.E. Wilson instead. Wondering about parking? Find out at our parking page! Or check out OSU's visitor parking page! For safety reasons, non-participants will need to stay in the designated viewing area as specified by the instructor. If you would like to watch your child's archery class, please check in with the KidSpirit office and bring a valid photo ID to recieve your visitor's pass!